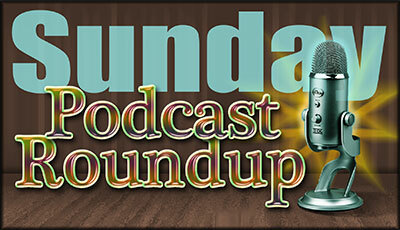 This week, the Sunday roundup contains all kinds of podcast-ey goodness: Nature tells you why only one in three people on earth can drink milk; 100 Years of Horror takes you back to 1959, when director William Castle used Percepto technology to shock theatre audiences out of their seats; Grammar Girl explains why some people feel entitled to say things like ‘we are not amused’ without being ironic! And that’s just for starters — enjoy! In episode 77 of APG, Captain Jeff interviews Thomas Salme, the passenger who helped land a Continental Airlines 757 full of passengers when the captain lost consciousness! Captain Jeff also talks about OpenAirplane, the new online way to rent a plane (hey, don’t get too excited; I understand that a valid pilot’s license will be required at some point). He also comments on the story of a Delta commercial flight that got stuck in a foot of mud (! ), and gives you the latest updates on Asiana flight 214. Then, ever wonder what happens when a commercial airliner runs out of fuel during a flight? How about what happens to the undercarriage of a plane when the pilot accidentally makes a ‘wheelbarrow landing’ (hint: kaa-CHING!)? In episode 76, Captain Jeff talks about a few hair-raising real-life incidents involving both of these scenarios. He also talks about other news and listener feedback, as well as updates on the Dreamliner 787 battery issues and the Asiana 214 tragedy. Want to enjoy nature without having to go outside? No problem, just download the latest podcast episodes from Nature magazine! In the August 1 episode, co-hosts Thea Cunningham and Kerri Smith discover why only about one in three people are able to drink milk, and how this development is pretty darn recent in evolutionary terms. Then they talk to some scientists who have invented teeny-tiny thermometers that measure the temperature inside cells; these scientists then go on to explain why this is really awesome! If that’s not enough, check out the July 25 episode, where Thea and Kerri report on how antibiotics are having a wee bit of trouble keeping up with the newest superbugs, and why this is really bad! They also find out how flatworms are able to regrow their heads after being chopped up into smaller pieces. (Hmm. I’m sure the flatworms would have told them the secret if they’d just asked.) After this, T and K give you a quick overview of the greatest scientific discoveries of the week! In Futures, Nature magazine’s weekly science fiction slot, Henry Gee reads Ken Hinckley’s sci-fi short story, The Ostracons of Europa! A dynamic duo of films awaits you, courtesy of the 100 Years of Horror podcast! First, Phantom Erik and Lester Reaper are joined by Gill and Roscoe of the Bodacious Horror podcast, as they venture into the darkest vaults of Hammer films in search of vampires! Their quarry: the 1958 classic Horror of Dracula. Then Erik and Lester are left to tackle The Tingler! Yes, it’s the 1959 thriller starring the inimitable Vincent Price! Having worked with Price the previous year to create House on Haunted Hill, director William Castle designed even more outrageous gimmicks, including the installation of Percepto buzzers in theatre seats and the insertion of a full-colour (well, red at least) bloody-bathtub scene in the middle of this otherwise black-and-white thriller. With episode 11, Cinema Beef Podcast enters the double digits! This time, Gary Hill and Neil (Newty) Lemoi catch the unrated version of My Bloody Valentine! Then it’s off to Manhattan where Jason paints the town red in the eighth installment of the Friday the 13th franchise! Finally, the guys head back to 1983, to take in the prison movie, Bad Boys, starring Sean Penn. Mark your calendars: the season premiere of The Cutting Room movie podcast is gonna drop on September 19! In the meantime, you can enjoy this blast from the not-too-distant past with Episode 9! This time out, Thomas Dettloff, Billy Bourassa Jr., Joseph Christiana, and Max Koch take a ‘threeeeee oww-er tooour!’ through the history of exploitation films! The conversation takes in Tod Browning’s Freaks (1932), Scream, Blacula, Scream (1973), Takashi Miike’s Ichi the Killer (2001), and the 2011 Canuxploitation film, Hobo with a Shotgun! This week, King’s Town Ted and Anthony Mann take a retrospective look at James Wan’s brief but interesting filmography. This is the man who brought us the Saw franchise, Insidious, and, most recently, The Conjuring — not too shabby! They discuss his stylish approach, and how it sometimes trumps originality and story, though always with intriguing results. They also remind listeners to send in their suggestions for the upcoming HorrorEtc. Book Club episode! It’s an international episode of Movie Podcast Weekly, as co-hosts Jason Pyles, Karl Huddleston, Andy Howell, and Josh Ligairi are joined by Willis Wheeler (of the Terror Troop podcast) and movie aficionado Keith Stein, from way up in Toronto, Canada (remember, the second ‘t’ is silent — SILENT!). They talk about two new movies: The Wolverine (2011), about a genuine Canadian superhero, and The Way Way Back, where Steve Carell plays a genuine d-bag! The mini-reviews include a discussion of noteworthy westerns after Karl reviews The Searchers (1956), and the guys also look at Hulk Vs. (2009), The Croods (2013), Searching for Sugar Man (2012), Sinister (2012), Murder on the Orient Express (2010), and The Evil Dead (1981)! In Episode 330 of Night of the Living Podcast, join Amy, Andy, Freddy, Kelley, and Chiz for their recap of Monsters of Various Sizes Month (soon to be a national holiday). At some point in the show, Kelley reads the news (if you’ve ever heard Kelley read the news, you will know that this is an awesome thing), and Amy attempts to unravels the serpentine plot of Pines, the new thriller from Blake Crouch! In Episode 87 of ScreamQueenz, Patrick celebrates the show’s third anniversary with special guest-hosts Chrysten Peddie and Eddie Furth. They invite you to a Murder Party (2007), and then lay down some spoiler-free reviews of V/H/S 2 and The Conjuring. And don’t miss Patrick’s awesome interview with Stacy Rock, the actor and musician who played ‘Lexi’ in Murder Party! With the Royal Family everywhere in the news, Grammar Girl Mignon Fogarty looks at a perplexing habit of royals everywhere: using the royal ‘we’, aka pluralis majestatis. Written by S.F. journalist Constance Hale, episode 377 offers an amusing and eye-opening history lesson (and it goes back a loooong way) that explains who the second party is, and why royals (and a whole bunch of other people who shouldn’t do it) feel entitled to refer to themselves in the plural sense! Yay! It’s the monthly free episode from HPPodcraft! This week, co-hosts Chad Fifer and Chris Lackey deliver the first episode in a three-part review of Arthur Machen’s The Red Hand. Oh, by the way, if you haven’t seen their 2005 film, The Call of Cthulhu, you’ve got to check it out! It’s spooky, silent, and conveys this H.P. Lovecraft story better than any other version. The DVD is also loaded with extras that should be especially fascinating to low-budget indie creators! This week, Mur Lafferty uploads her latest audio chapters of The Shambling Guide to New York City — Chapters 13 and 14. And if you haven’t bought a copy yet, you can find it here! Quasar Dragon has some more great free audio fiction this week! First, from Decoder Ring Theater, it’s episode 96 of Red Panda Adventures: The End of the Beginning, a World War II noir thriller that pits our hero against Hitler’s terrifying God of War! This week, in episode 8.30, join co-hosts Mary Robinette Kowal, Brandon Sanderson, Howard Tayler, and Dan Wells as they talk about reluctant characters. These are story characters who have to be either dragged kicking and screaming into an adventure or goaded with a pointed stick into getting involved in any problems but their own. Our intrepid co-hosts will tell you how to actually make these characters interesting — no mean feat! This site contains links to some of my favourite podcasts about writing, publishing, and pop culture. 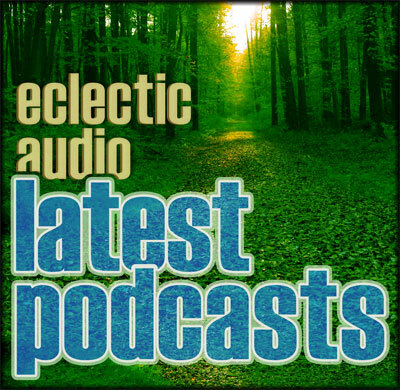 I review the latest episodes, shine a spotlight on great episodes from the past and present, and update you on new developments as they happen.